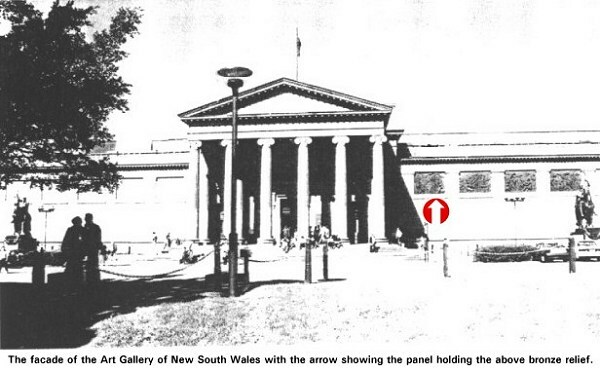 In 1903, the Trustees of the Art Gallery of New South Wales invited sculptors to submit models in a competition for two panels, needed for the facade of the Art Gallery, each (11ft. 3in. X 7ft.6in.) high and the subjects to be chosen were typical of Assyrian and Egyptian Art to form, together with panels already in place, a complete series of the chief historic phases of Art. The design submitted by Gilbert Bayes (1872-1953) of England was selected on behalf of the trustees by Sir Alfred East and George Frampton in 1903. 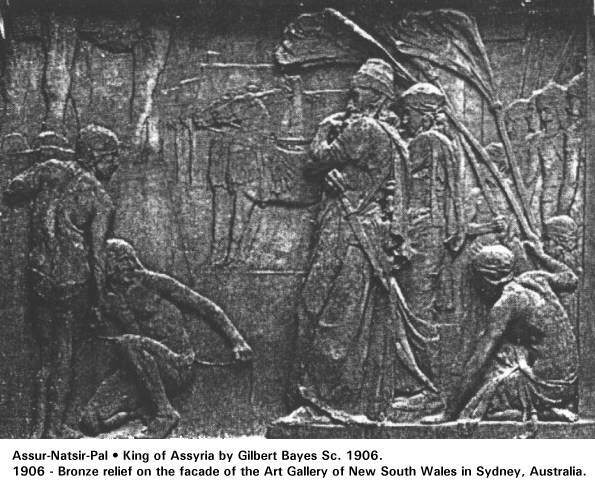 Gilbert Bayes finished his work in 1906 and he was awarded 50 pounds for (fine Assyrian panel). The finished relief was placed in position in February 1907. The lettering impressed on the relief were by A. B. Burton, Founder of Thames Ditton in England. The relief shows Assur-Natsir-Pal, King of Assyria, from 883-858 B.C., present with the Queen at the opening of a new building. After the death of Tiglath-Pileser until his time Assyria was reduced to comparative powerlessness, but under him the boundaries of the empire were extended, splended palaces, temples and other buildings raised, whose elaborate sculptures and rich paintings bear witness to the fact that in his day culminated the first period of Assyrian Art. The theme of the relief is, then, most appropriate for the selection.